Surprise! Malls still exist and thrive in the age of Amazon! I haven’t walked around in a mall for years but I had a dinner date with friends at a restaurant that happened to be at the mall. Since I got there early, I shopped. I should have gone to the shoe store pronto since I wore the wrong pair of shoes to shop (totally out of analog shopping practice) – my toenail is probably going to fall off because I chose the Lush rather than shoe adventure. My friend had told me about their shampoo bars years ago and I’ve always meant to try them. I wanted one for hair loss and the sales lady told me ‘New’ might encourage baby hairs. I also grabbed the ‘Jumping Juniper’ because it has rosemary in it, and I’ve heard that can also encourage hair growth. I’ve used the ‘New’ a few times and so far I’m liking it. I kinda’ wish I didn’t, because I don’t want to develop a Lush habit, because $$$ but after using it, I feel like my dander problems have improved. I’m not sure about hair growth, it might take a while for that, but I like the way my hair looks after and I love the scent. I especially like the smell of the juniper one. 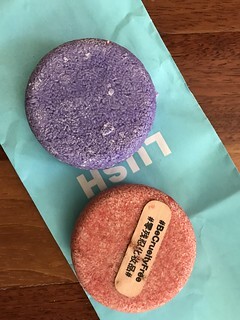 For comparison, other shampoo bars from Chagrin Valley are better than these Lush bars. Some of my favorites include Babassu Marshmallow and Ayurvedic Herb. They are quite effective at treating my dandruff, much more effectively than Lush. So yes, I just said I like these Lush bars. Which should you get? If you’re not used to bar shampoo, Lush could be good for first timers since they lather easily and don’t dissolve as quickly as the Chagrin Valley. Overall though, Chagrin Valley is a superior product because they don’t use sulfates and they also seem to use up more quickly because they’re more old school soaps (oils and sodium hydroxide). For me, going forward, I’d stick to Chagrin Valley if I’m ordering online. But if I’m ever in a Lush shop, I’d probably grab a couple more bars of shampoo. They’re hard to resist when I’m in the store smelling them.